Artist’s impression of the planet and Barnard’s star setting. The evidence consists of a slight repeating change to the light from Barnard’s star, a small star 5.9 light-years away. The data suggests the presence of a cold planet at least 3.2 times heavier than Earth, orbiting at a much farther distance than expected. But its relative closeness to Earth makes it an important world that scientists may soon be able to take a picture of directly. 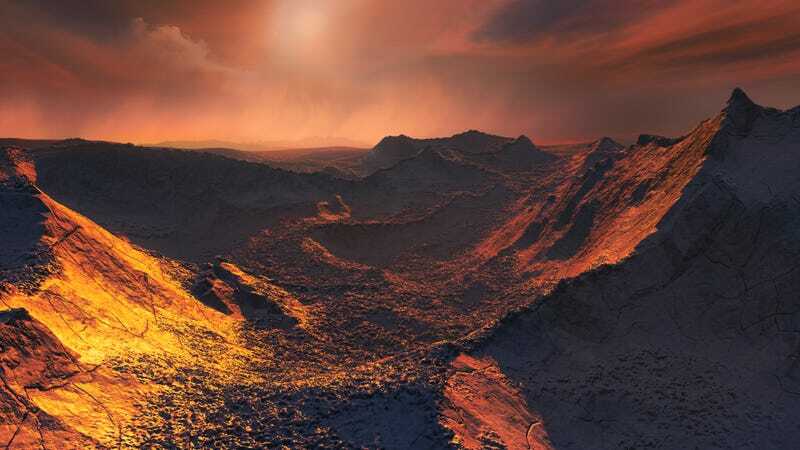 Barnard’s star is the closest single-star system to Earth, and like many nearby stars, it is relatively dim and cool, with a temperature around 3,000 Celsius, and a mass and radius both around a sixth those of the Sun. Its characteristics are similar to other potential exoplanet-hosting stars we’ve gotten excited about, like Proxima Centauri and TRAPPIST-1. Despite a history of promising but ultimately fruitless searches for planets around this star, an analysis of archival data from observations of the star’s velocity seemed to reveal a slight repeating signal. The scientists needed more before making a conclusion, so they took lots of spectrometry data measuring the slight shifts in the wavelengths of the star’s light caused by changes in its velocity relative to Earth. They observed the star on “every possible night” using the CARMENES spectrometer on a telescope at the Calar Alto Observatory in Spain, as well as through other telescopes, and published their results in Nature. The followup data revealed the slight signal that would match a super-Earth orbiting Barnard’s star every 233 days, at about 40 percent the distance between the Earth and the Sun. That’s about the same as the average distance between Mercury and the Sun. It sounds close, but it’s quite far compared to similar M-dwarf systems that astronomers have observed. Though the planet is outside the star’s habitable zone, meaning it’s really cold, it’s an important potential target for exoplanet studies, Paul Robertson, physics and astronomy professor at the University of California Irvine professor who was not involved in the study, told Gizmodo. Its distance means that there’s the potential to image the planet separate from the star, rather than implying the existence of a planet based on changes to starlight. Its important to note that there’s still some ambiguity to the data; there’s a reason they call this a candidate detection. And who knows, perhaps there are closer exoplanets that just haven’t been detectable yet. Anglada-Escude would like to continue taking data on the star, and hopefully detecting the planet through other direct or indirect methods.